We are located in Beatty Nevada and have been actively part of our community since May of 2011 when we were first granted our charter with a total of 36 members (Now 119 Members). Our post would be named John Strozzi Post #12108 in honor of Sargent Strozzi, a former veteran of Beatty who gave the ultimate sacrifice during WWII. John Strozzi Post #12108 distinguishes itself as the “The Can Do Post” which has made great strides during its first years as a charter VFW post and through its Auxiliary. 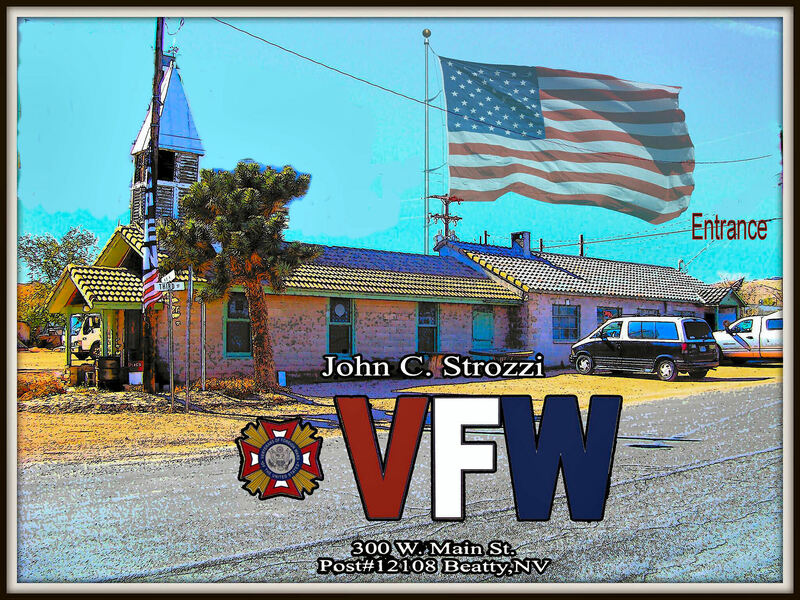 The Post was dedicated by Commander in Chief of VFW John Stroud on August 1st, 2014 presently based out of a former 1905 Rhyolite church located at 300 W Main St. in Beatty, NV. Some interesting facts about the current post are that over 90% of the decorations and memorabilia are related to a member. We also have displayed the only Medal of Honor awarded to a Nevada service member during WWII. It helps support Local VFW folks in need and Scholarships for students of VFW families. Thanks..
Dan Sanders was elected as the new post Commander of John Strozzi Post #12108 in Beatty. Dan brings in with him leadership experience.